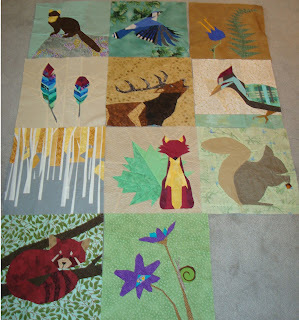 I have been busy with these blocks lately...put aside others things I should be doing because I am addicted to these. Here is the latest two to get finished and then I only have one left. Teri from Handiwerx just posted the last block and it is a trillium flower. She notes you are not suppose to pick them as it can kill them, but I have to admit that they grew wild in the woods behind my house and as a child I remember picking them occasionally although I am sure my mother told us not to. Most of them were the white variety and occasionally there would be the red one and I remember thinking they were so cool because they were the rare treat to find so I'll be making the red one because it has always been special to me. See where his back foot is resting in midair and it appears the flowers between his legs are growing in that same midair way. OOPs!!! That is not the way it was suppose to be. Luckily it was just a matter of undoing a couple of seams and replacing that piece so it wasn't too hard to fix. I have been so set in cranking these out that sometimes I need to slow down and double check my work. 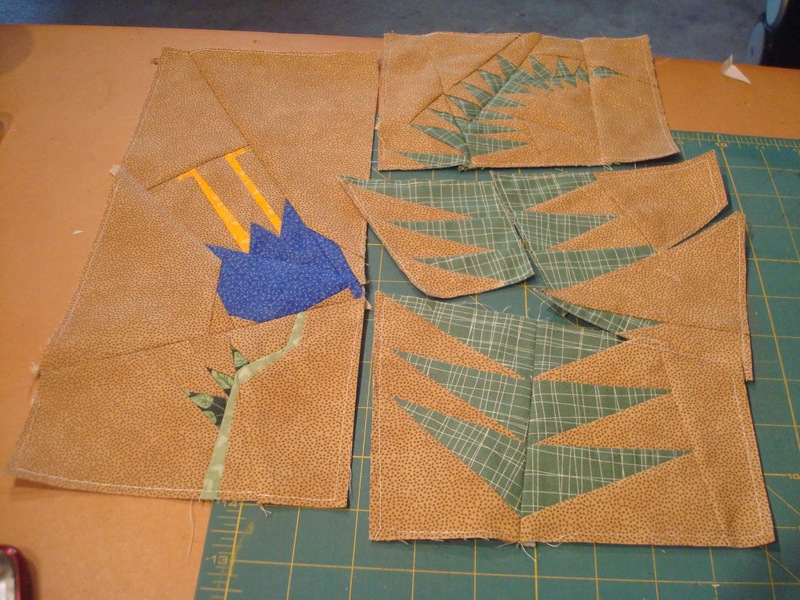 Believe it or not on each of these pieces I mark it with the typle of fabric that is suppose to go in each section but still got it wrong. 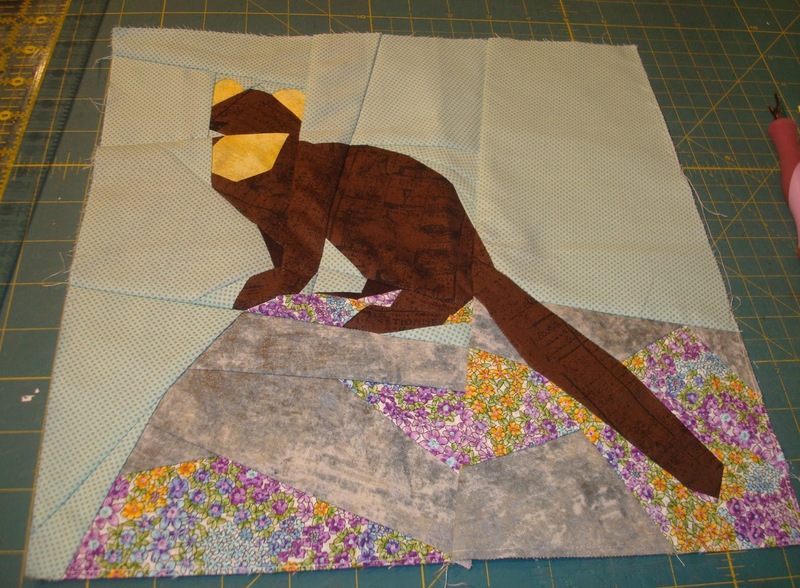 Here is the corrected block with my little rascal standing on a solid piece of rock under his foot. Wow what a difference that is much better!!! 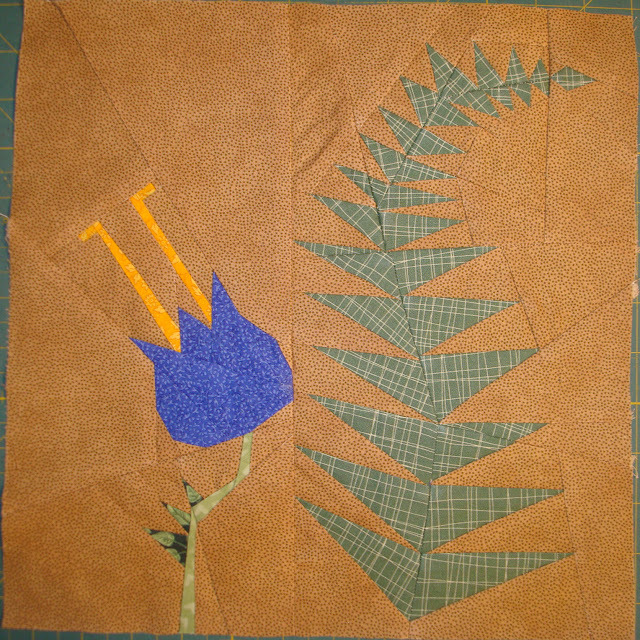 At this point I laid all the blocks out on the floor again and decided the fern and flower block I still needed would need a bit darker background to make the elk background not be so different from the rest. 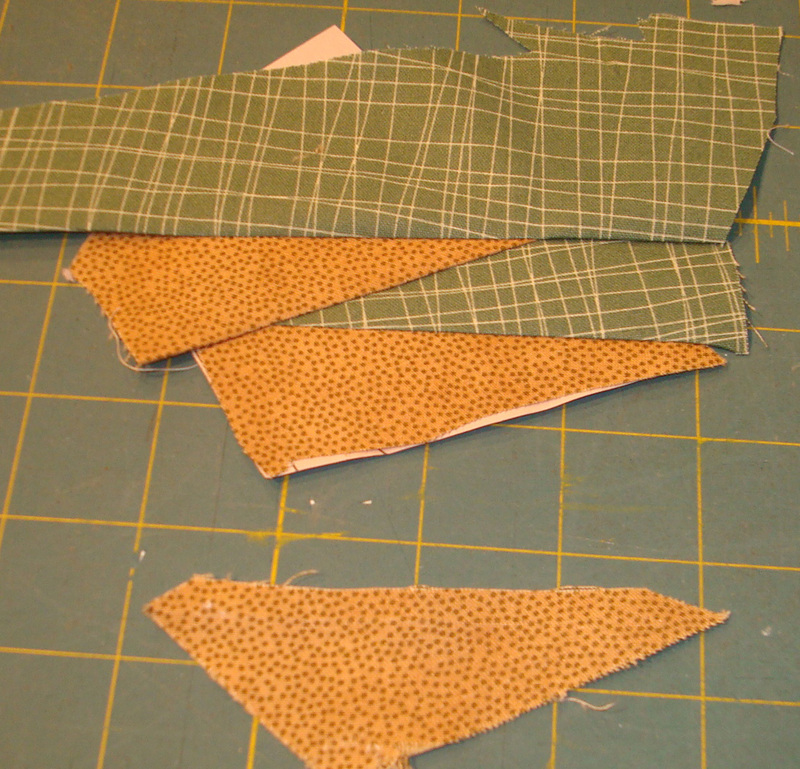 I had a couple different choices of fabrics and had just a fat quarter of each. After eliminating one for being to busy I set to work. 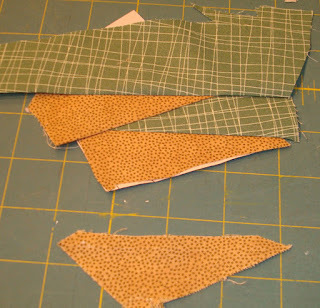 Julianna from Sewing Under Rainbow had listed that a fat quarter for the background would work but I find I do not always economize my fabric well enough. 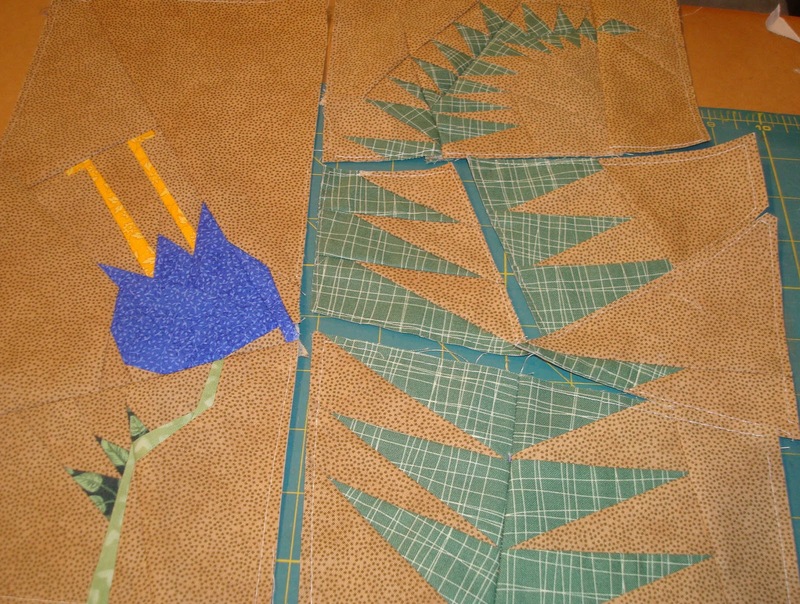 I set to work with the pieces requiring the largest sections of background fabric first. By the time I had 2/3rds of the sections done I knew this was going to be a close one. I didn't want to stop till I found out if I had enough background to complete the block. Now I should add that the background I chose was something I picked up only God knows where. I think a garage sale find of years gone by but I could have just as easily bought it this year at a quilt show and although it did have the selvage edge telling me it was a Moda print I wasn't sure I would EVER be able to get more of it. I stayed up till 12:13 AM Saturday morning until I had every piece done. Whew I made it with this much left to spare. I think this was barely 2 inches wide by not quite 5 inches. Sew LUCKY so I went to bed a little queued up and excited to put it together the next day...which was by then that day. Crazy lady that I am I woke up at 5:42am and decided I had better get back to sleep if I wanted to have energy to get this thing put together right. After waking at 7AM and having a couple cups of coffee I set out to complete this block. I got to here and noticed another OOPs moment that I seem to be having too many of these days. Now the piece fit the puzzle opening but the colors were all wrong! @#$% Stay calm and take a deep breath Kathy...this has got to work. 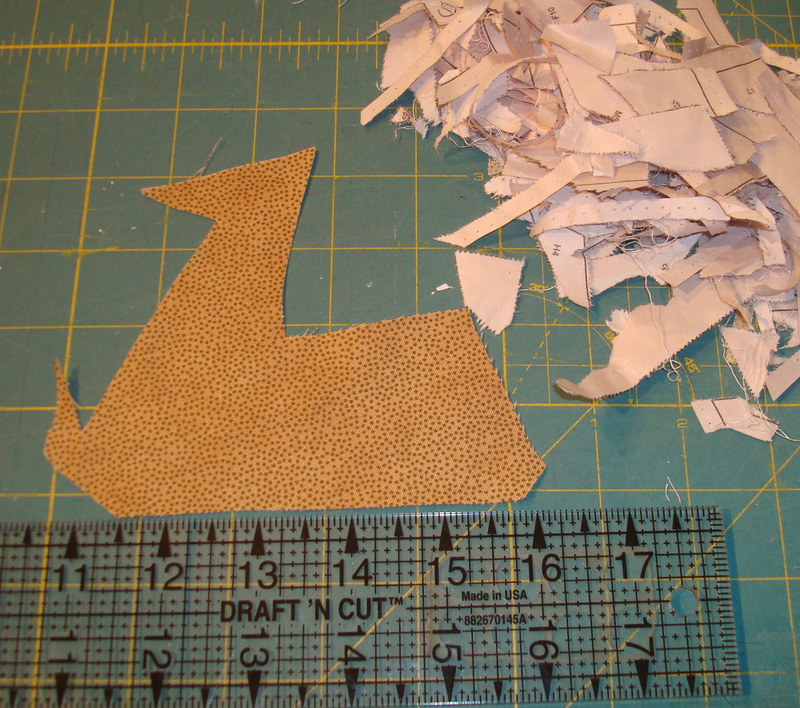 Remember that less that 2 by 5 inch piece of fabric left? Well by a wing and a prayer it was enough. Luckily for me the first section needing the background was in position number one and that made it easier to use that scrap in. Even more importantly it was the biggest piece needed so I could try to figure out how to get this job done with the VERY limited fabric left at by disposal. Here is what I was able to achieve with that small scrap. The wrong one is on the right. The one on the left is the colors in the order they should have been. I was able to get 2 of the 3 background sections done. Now I just had to hope I could tear the wrong one apart and get one of those pieces to fit the One background piece I still needed. Luckily it was the smaller of the three needed so I had a feeling it might work out but it was a close call. Too close. But what was important at this moment was it was going to happen. Still since the angles are all so different I still wasn't quite sure. Looks like it would work. And let me tell you it was just barely. I double stitched it in there because the seam allowance wasn't quite the quarter inch but it would do. Funny part is after all that I forgot to take a picture of the final product but I rectified that and here it is. As addicted as I have been to these blocks maybe it is a good thing these are coming to an end. I don't need all the stress. But you know I have loved every minute of the many hours I have put into this project. I have nothing but wonderful things to say about all the great ladies who have put so much time into creating and sharing these awesome patterns with us these past few months. Here is how they are looking together with this latest one so you can see how important it was to get the darker background in this block. It really compliments the background of the elk block. I haven't been sure what to do with these blocks as a final project but I finally have formed a plan in my mind and just have to get it onto paper and set in motion. I bought fabric for it this weekend and have until the end of August to add it to the linky party so I still have to keep busy with these for awhile. 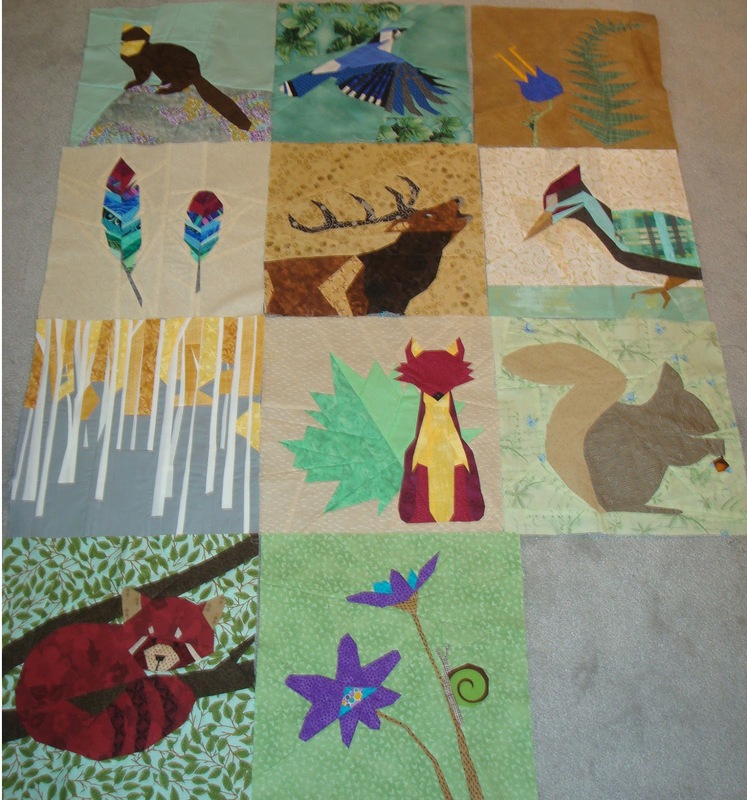 Going to be a busy summer as I still have to complete a couple baby quilts for my grandson who is due in early September. Last I updated your about the expected grandchild we were not sure if it was a girl or boy but are excited to have our first grandson arriving in early September. They were thinking of naming him Calvin after his paternal grandfather but have settled after much discussion and consideration on naming him Ayden. 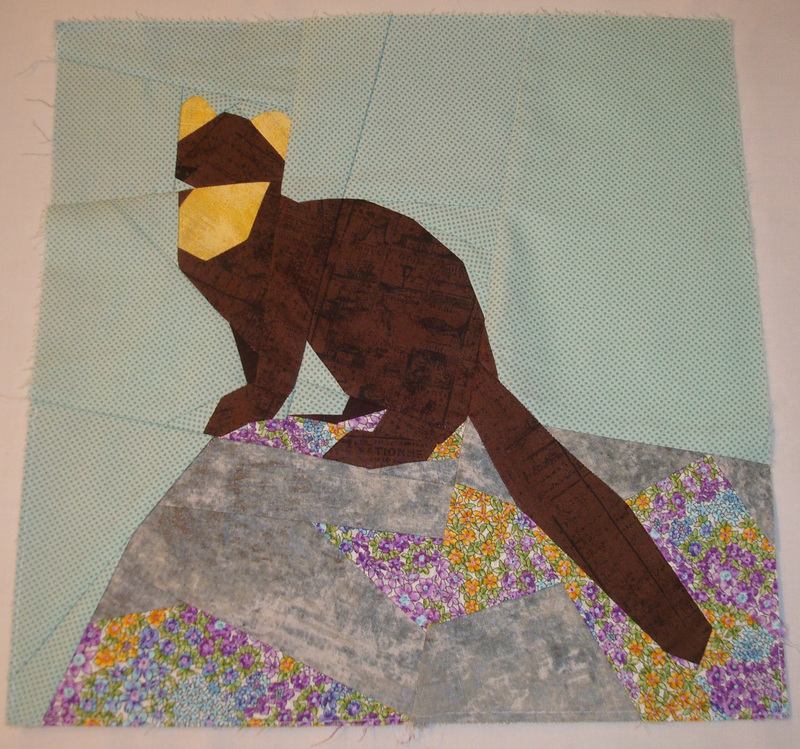 So I need to get busy on adding his name to the quilt I started earlier in the year. I had to wait until it was locked down and I think it is definitely a little Ayden for sure. I have been staying on task so far with my monthly BOM projects and here we go again with the start of another new month. I hope to share my May blocks soons but this post has already been quite long so I will update you on my progress another time. Dinner times beckons me to remember I do more than quilt around here. These are lovely! I made one of her blocks too. It was fun.